In the late 1990s, a travel-savvy American observed that relocation management companies and corporate HR tend to have a big problem. How to deal with numerous local destination service providers in multiple locations around the world without getting overwhelmed by the co-ordination and cultural differences in service delivery and under-whelmed by the uneven quality? How can one ensure the same level of competent destination service whether supporting an assignee in Ulaanbaatar as in Frankfurt, or Sao Paulo, New York or Mexico City? The answer was simple: a highly focused, single global Destination Service Provider structured around a cadre of its own seasoned consultants, resident in the host cities, and trained to a level of service that reflects the zeal of its founder. Going there is then local…yet very global. Diana Busk, the zealous American founder, has spent most of her adult life working outside the USA but with a passion to bring well known American-style service to the rest of the world. Headquartered in London, the company was launched providing Destination Services to Relocation Management Companies and the Corporate sector in just four countries. Since then, it has expanded rapidly to over 150 cities spanning 50 countries. And with a culture and method that enormously facilitates a responsiveness to broaden the presence even further, on demand. Technology has played an important part in the Going-there distinctive. The company has pioneered the use of relocation on-demand. 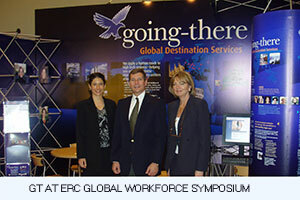 A powerful Workforce application, GT2go, is a pathfinder without parallel in the industry. Used in conjunction with our traditional hand-holding programmes, such as Home Search or Settling in, it informs and helps gain efficiencies in the relocation process. Used as part of our GT Express! programme or as a stand-alone, it’s a practical self-help tool for assignees and families. With the trust of our clients, the commitment of our people and our ongoing investments in technology and education, Going-there’s second decade is proving to be more exciting and full of growth than the first.